Robo's got a new look! The artist has given him much more color along with the rest of the Fortress. We've been working hard to polish Zarnok Fortress to make it the best game we can possibly make. Part of this polish has been programming, but a large part of it has been visual. After getting a lot of requests to make the game more colorful, Will Vali (the game's artist) thought it would be fitting to make the protagonist more colorful too! Robo's World: The Blulite Rocks had a very colorful world, but Robo himself was a simple plain grey, which is how he began in this game too. Eventually, Will pitched the idea of making Robo blue. As much as I liked the concept image, I thought making him pure blue would be too much like Mega-man. "Well, adding more color will make him more memorable" Will said. "No doubt" I responded. "Of course, if we really wanted to make him memorable, we could make him yellow" (since according to color psychology, yellow is the most memorable color). "Actually, what if we kept the blue but gave him yellow accents?" I asked. "Let me try it out" Will responded. The concept he sent back looked great, so we updated the character model in Spine and added it to the game. If we weren't using Spine, a change like this would have taken a LONG time. While "Blue Robo" will only be present in Beta #2 and onwards, you can try out the game's Demo for yourself right now! You can grab Demo V5 from our website, robosworld.com or from Itch.io. Available for Windows, Mac, and Linux! 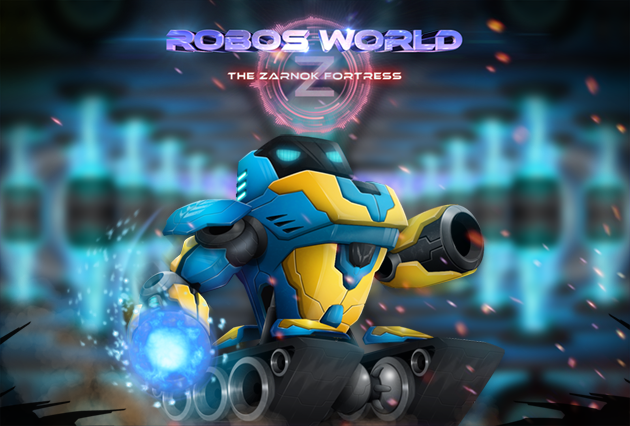 Don't forget to vote for Robo's World: The Zarnok Fortress on Steam Greenlight! We're going to keep polishing the game until we get approved on Steam Greenlight. Follow us on IndieDB to stay in the loop and follow me on Twitter for more frequent updates!